Road cycling in Richmond Park is a major activity following the explosion of interest in cycling since the 2012 Olympic Road Race event (which passed through the park!). The road around the edge of Richmond Park is around 6.73 miles (10.83 km) and offers steep climbs, technical descents and some steady ascents. Additionally there are two roads that can be used to cut across the park so that variations can be added into the circuit. These are from Robin Hood Gate past the central Pen Ponds car park and White Lodge and through to the Sheen Gate. Also there is a smaller pathway from the Pen Ponds car park through to the outer road and then the exit road to Ham Gate. The preferred direction by most cyclists is anti-clockwise as it is easier and safer to turn left at the 5 mini roundabouts that need to be navigated on each circuit. The difficulty or level of effort of one way over the other is highly debated by cyclists; the wind, wind direction and the level of traffic are significant factors on any given day. 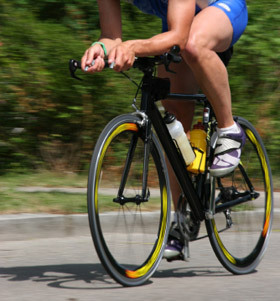 Most road cyclists limit their efforts to 2 to 4 circuits. Keeping to speed limits of 20mph a cyclist would lap the circuit in 20 minutes, however as the circuit is quite hilly a typical lap of 25 minutes will leave any cyclist feeling they have worked hard! If the circuit is started at Richmond Gate there is a descent all the way to Kingston Gate followed by a climb up Dark Hill (100 ft ascent approximately) and a relatively flat section along the Kingston Hill side of the park. After this there is a technical descent (care) down Broomfield Hill to Robin Hood Gate and the flat section along the bottom of the park to Roehampton Gate. From here the road climbs again, gently at first prior to the final steeper climb up Sawyers Hill to complete the circuit (150ft ascent). If the circuit is tackled clockwise then it is generally slower – partly due to the navigation of the roundabouts and partly as the climb up Broomfield Hill towards Kingston Gate from the Robin Hood Gate roundabout is quite arduous (and is the hardest climb). Apart from providing a great circuit for cycle training and fitness, the road circuit is used for various racing events and is also part of a number of charity ride routes. Every year (usually in September) the park hosts the London Duathlon which is a run / bike / run event. The London Duathlon is one of the world's largest duathlon and offers athletes of all abilities the chance to race in a unique environment. There are a number of types of entry (Public, Charity, a Corporate Challenge Individual and Club Members) and a number of "Challenges" to choose from ranging from Individual, Sprint, Classic and Ultra with Teams and Relay categories too. For full event details visit http://www.londonduathlon.com. For the keener cycling specialist London Dynamo Cycling Club organise 10 mile time trials in the park – for more information and dates check their website on http://www.londondynamo.co.uk.